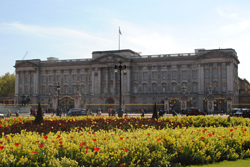 • Buckingham Palace opened its 19 State Rooms to the public last weekend under the theme of ‘A Royal Welcome’. As well as the chance to see the State Rooms themselves, a series of displays and films are located throughout the palace which show how Royal Household staff are involved in welcoming the tens of thousands of guests who come to the palace each year for receptions, State Banquets, garden parties and investitures. And, for the first time, the public can enter the palace through the Grand Entrance where the Australian State Coach will be displayed. Other highlights include the Palace Ballroom – set up for a State Banquet with silver gilt candelabra and centrepieces from King George IV’s grand service, displays recreating part of the dresser’s workroom and the palace kitchens, pantries and wine cellars in the throes of preparing for a State Banquet, and some of the gifts received during State Visits to the palace. Items of Queen Elizabeth II’s personal jewellery are also on display including the Kokoshnik Tiara, worn at a State Banquet in honour of the President of Mexico this year, Queen Mary’s Dorset bow brooch and the diamond Coronation necklace and earrings. The palace is open until 27th September. Admission charge applies. For more, see www.royalcollection.org.uk. • A new interactive map of public outdoor areas in London has been created to help encourage the city’s residents and tourists to make the most of the great outdoors this summer. The map details more than 200 public spaces including squares, green spaces and public street amenities, many of which have been improved as part of the Mayor of London, Boris Johnson’s Great Outdoors initiative which has seen more than £400 million invested in 242 projects since 2009. To check out the map, follow this link. • A new exhibition examining contemporary portraiture – and its inspiration from traditional modes of portraiture such as miniatures, medals and death masks – opened at the V&A in South Kensington this week. Facing History: Contemporary Portraiture features more than 80 prints and photographs drawn from the V&A’s collection and created by artists including Julian Opie, Grayson Perry, Thomas Ruff, Maud Sulter and Gavin Turk. Works featured include self-referential pieces like Grayson Perry’s pair of prints, Mr and Mrs Perry and Gavin Turk’s Portrait of Something that I’ll Never Really See, portraits of real and fictional characters like Brian D Cohen’s Man with Eyes Closed (Walter White) whose subject is both a character from US TV series Breaking Bad and Bryan Cranston, the actor who played him, Cecilia Mandrile’s identity-card inspired ID-Intensively Displaced series, and 11 pieces from Ellen Heck’s Forty Fridas. Exhibition runs until 24th April. Admission is free. For more, see www.vam.ac.uk.